Rigdon’s interest in “gifts of the Spirit” is understandable. He was susceptible to delusional thinking and deranged episodes, including seizures, fits, and fainting spells. He interpreted these episodes as manifestations of the spirit, evidence of a divine calling. This is consistent with the account of Loammi Rigdon, a physician and Sidney’s next older brother, who attributed Sidney’s behavior to a childhood head trauma that resulted when he was thrown by a horse and dragged with his feet caught in the stirrups. “He [Rigdon] brought to his aid (in preaching while still a Campbellite preacher) the eccentric and grotesque workings of a nervous and enthusiastic temperament, which at times threw him into spasms and swoonings, similar to those nervous agitations which have so often prevailed, not only in individual instances, but raged as epidemics both in and out of the churches. These nervous fits he interpreted into the agony of the Holy Spirit as multitudes had done before him, and contended that the miraculous spiritual gifts of the apostolic age were now about to be restored to the church.” * Turner: op. cit., pp. 24-5. 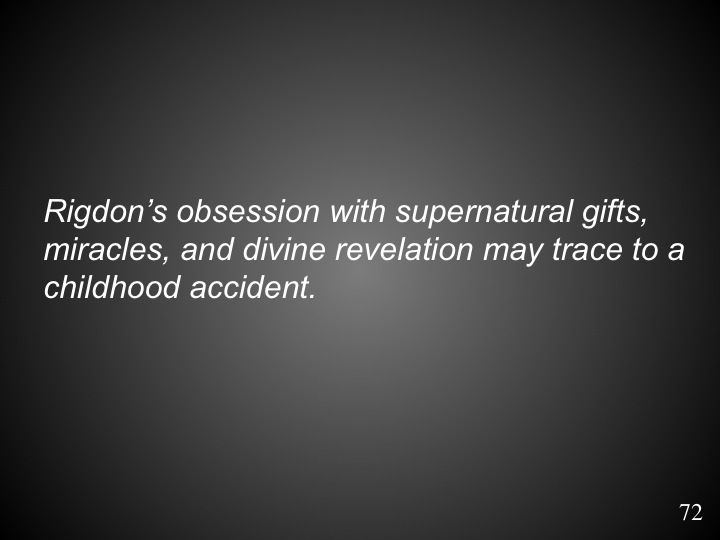 Rigdon recorded many revelations from God and from mythical dead people using the first person voice. Example: The Book of the Revelations of Jesus Christ to the Children of Zion (1868). Section 86 – ministering of Phin’s Phineas the angel high priest to his son and descendant.